Product Details-Extra safety on long and short journeys due to its lockable snap clips, Includes two storage compartments for treats for your pet, Colour- Dark Grey. Includes handle for pulling the carrier,Ventilation slits for ideal air circulation, It can be opened at the top and front. Product Description-Take to the sky with your mind at ease. 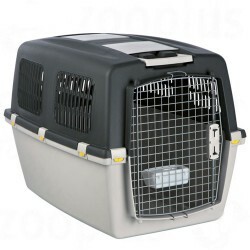 Perfect for airline travel, each kennel features a heavy duty plastic shell, durable wire doors that interlock for added security, wire ventilation windows to promote healthy air flow and plastic wing-nuts that wont corrode for durable assembly. The kennel is IATA approved and accepted by most airlines. It also features 2 roomy storage trays and a handle on top for pulling.